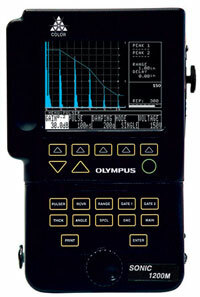 The Sonic 1200M ultrasonic flaw detector incorporates modular display design for simplicity of operation. It has various innovative design features such as an uncluttered keypad, rotating Smartknob, customer interchangeable displays, and PowerLink technology. The Sonic 1200M is an advanced lightweight digital ultrasonic flaw detector incorporating our exclusive modular display design for simplicity of operation. It has various innovative design features such as an uncluttered keypad, rotating Smartknob™, customer interchangeable displays, and PowerLink™ technology making it extremely simple and intuitive to operate. The Sonic 1200M (NSN: 6635-01-530-7826) incorporates all of the advanced features of the Sonic 1200HR+, including high resolution thickness gauging with readings down to 0.0050 inches, Distance Amplitude Correction (DAC), dual flaw gates, data logging of up to 5000 readings, narrow band receiver for enhanced signal to noise ratios, PowerLink™ transducer recognition, VGA output to heads-up display or monitor, and tunable square wave pulser. Additionally, the Sonic 1200M includes a interface following gate for immersion and bubbler applications, selectable negative spike pulser/tunable square wave pulser for the ultimate in resolution and power, display average, display persist, 4 kHz pulser repetition rate, and new Foreign Object Debris (FOD) and anti-marring case.